Steven (Chicagoland, United States) on 30 April 2010 in Cityscape & Urban. I'm off to Williamsburg, VA and Washington, DC to enjoy some down time and to take tons of photographs of the surrounding environs. This photo was taken in 1995, which was the last time I was in Washington, DC and before photography became a hobby of mine. I hope to share much better photos upon my return. 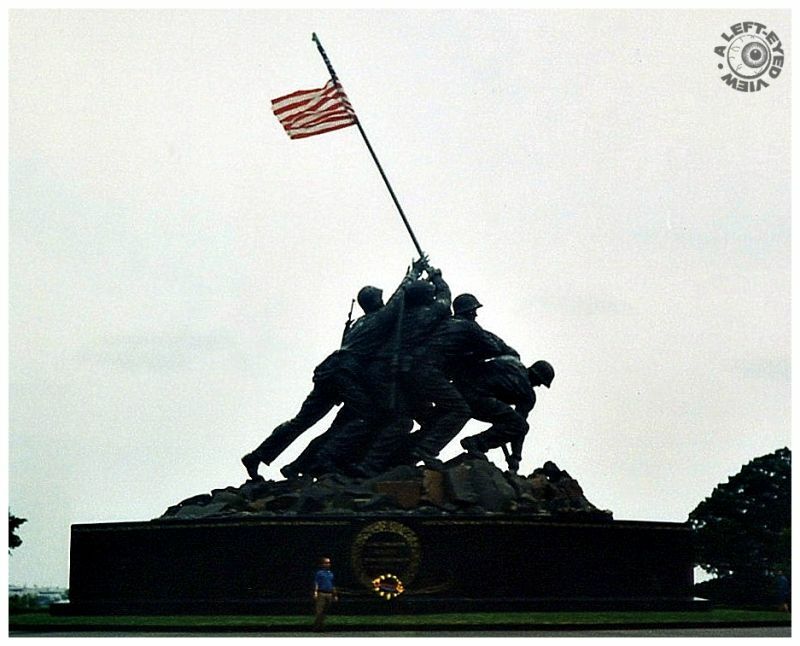 And hopefully the flag on the Iwo Jima memorial won't be wrapped around the pole like it was here. Photo taken in September of 1995. ~` hughe memorial~ enjoy your time away and take lots of great pictures~~! Ain't this sculpture inspired by a photograph too during WWII in the Pacific ? @Florence: Yes it was. Here it is. Have a nice trip, Steven.. It's not a bad shot, but one clearly sees your photographic progress since then. It will be interesting to compare this shot with your next version. Have a nice trip! Beautifully framed ! I saw the film of this battle! Never loses the impact, this memorial . . nor should it. CAn't wait to see your shots from this trip as well, be safe. Superb composition and your framing is very good. Bonne après-midi Steven. Yup yup can tell your progress though you can't help the twisting of the flag. It happens even on the one on my house and it never undoes itself. I always have to unwind it. Take care on your trip and hope to see some wonderful shots when you get back! Such an iconic sculpture ! Nice shot ! How can any American not feel pride!